Artificial Intelligence is a broad term defining machines that independently carry out tasks that formerly were considered the exclusive domain of humans. For example, a computer call AlphaGo recently beat a human champion in the ancient Chinese game of Go that is considered to be very intuitive. Machine learning is a branch of artificial intelligence in which computers have the ability to “learn” without being directly programmed. Such systems continually accumulate data and their internal algorithms are allowed to elaborate based on changes in data over time. AlphaGo employs machine learning as a part of its overall functioning. Detect fraud with ever-increasing precision every time a new scam is launched by hackers. Find “next best product” opportunities in more finely defined groups of members based on a wide variety of both internal and external data sources. Provide the next generation of “chat bots” that interact with members in both text and voice to solve complex customer service problems. While these technologies have a bright future, widespread use is some years away. 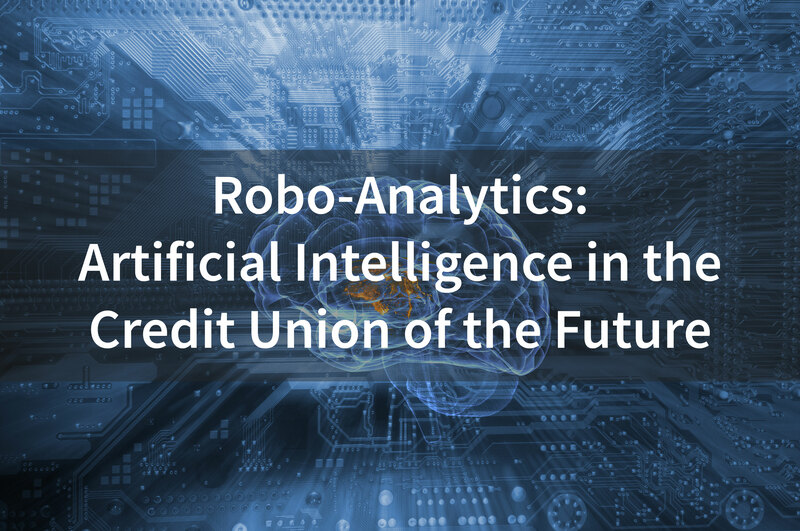 What credit unions can do now is to become experts in current data and analytics tools and techniques. In this way they will be ready when the wave of “robo-analytics” arrives.